We just finally got the song with the lyrics "boots with the fur... " out of our heads and sure enough fur is back and even stronger this fall/winter. We are seeing a huge trend in fur this year. Faux fur - lets clarify I don't want PITA hating on PrivyDoll. I adore the fur vest in a longer version. Pair it over a tunic dress and boots for a night out or utilize this as an easy accessory to transform your weekend gear into high fashion weekend gear with throwing it over a t shirt and jeans. You are instantly modern. I have seen fur on bags and boots again this year and have found some great budget finds. I am still awaiting the sold out faux chinchilla Rachel Zoe vest I bought off her QVC collection. Fur found on footwear is huge this season. I found some great finds on a budget. This great pair of boots found in Gray or Black for only $110 at Aldo. would go great with a pair of skinny jeans and bomber jacket. These are a designer knock off look they belong on a runway. Found at Nine West for only $149 these are eye stopping. Lets move onto the fur vest trend. Seen on celebrities everywhere. This is a must have to get through fall and winter 2010/2011. Luckily PrivyDoll found some great faux fur options. Fur vests is the must have piece. This dream vest from Rachel Roy found at Neiman Marcus retails for $895. Rachel Zoe is known for many things she loves, and one of those is faux fur. Her line on QVC has some dazzling turn your head, is that real fur -looks. 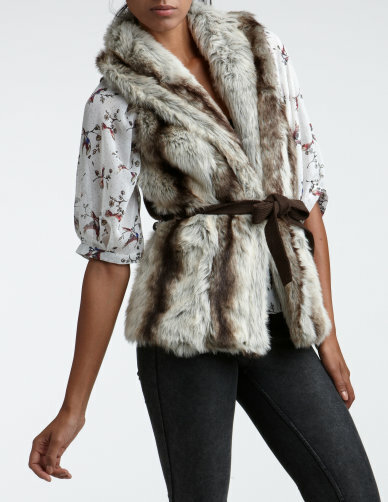 Take this faux sherling vest. Perfect for weekend or over a tunic and leggings. Found on QVC for $134. Love the color of this fur vest found on PiperLime for only $69! 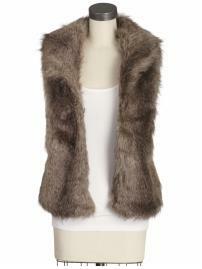 Here is an ultra good find on Charlotte Russe for a fur front vest for only $44. Lastly, this is another surprising budget fashionista find at KMart by the Jaclyn Smith collection for $41.